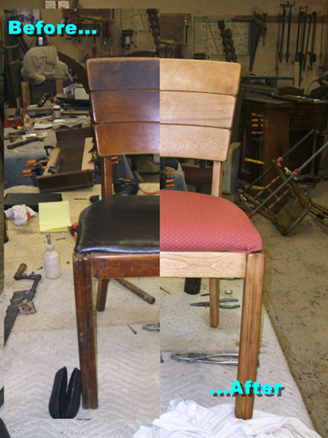 Full Service Upholstery repair, restoration, recovering in Cleveland. The finishing touch to a refinished chair, or hand carved sofa frame is re-upholstery. We offer complete recovering services, all you do is buy your fabric and we do the rest. We do custom work, leather, residential or commercial repairs. We strip the furniture to the frame, add new foam and re-tie springs when needed, cover with your chosen fabric, and return it to you better than new. 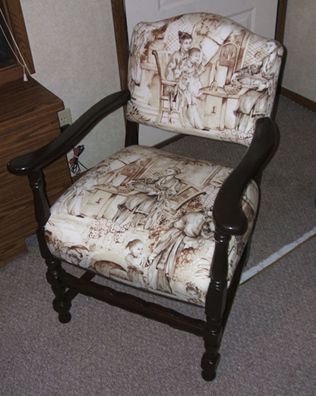 We make custom covers for your antique chairs, sofas, footstools, recliners, and even sectionals. Custom slipcovers are the best option to prevent spills or dirt gathering on furniture. It is less expensive to wash or dry-clean the slipcover than to call an upholstery cleaner. 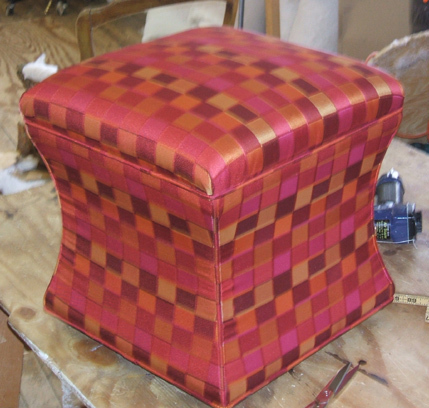 Upholstery services: Color Coordinating, Recovering, Re-gluing, Re-stuffing, Re-styling, Auto, Boat, etc. All work is completed in a timely manner. Contact us today for more information about our upholstery services. pattern, destined for a room with light walls, to add punch. Custom Headboard for a Designer Client. This custom headboard was ordered and created to fit the client's design need. 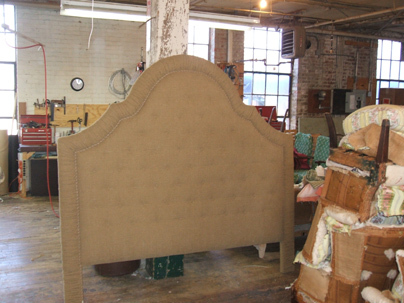 This headboard has a nice roping border and the many buttons add texture to the neutral color. When getting a quote for upholstery make sure you are comparing the exact services. Sometimes you may not be getting the right service for the price. Recovering or re-wrapping is not done at Tom's.